Damn, you look good. Just lose the snow, mmm kay? I am always the most excited for March out of the entire year. Well, except for April. And May. And then June. Yes I like those months much more than March. OK, scratch that. I’m just happy to be done with February! 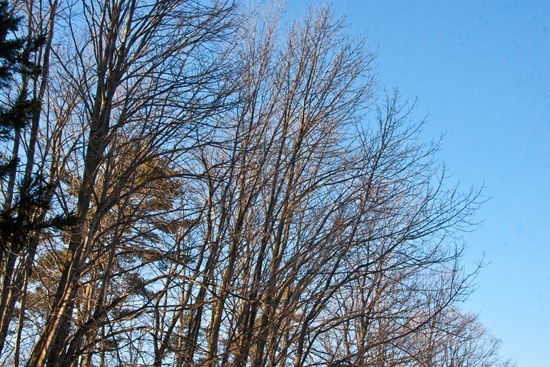 February is my least favourite month of the year because of the Winter blahs. On March 1st, there is hope. The days are getting longer. 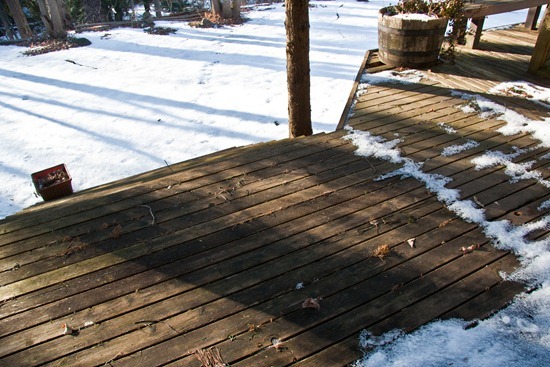 Even though it was –9C when I got up this morning, I know that warmer weather is on its way sometime between now and July 1st. Approximately. These Falafel Burgers are amazing. Addicting even…And I only had 1 bowl to clean up when it was all said and done. I had my eye on Julie’s recipe ever since I posted about it in my Recipe Link Love the other day. Ok, that is a bit of a lie…I completely stalked her post several times a day. I knew that these Falafel burgers would soon be in my belly. It was really only a matter of time. Well, technically, 3 days, but you shouldn’t wait that long….run, skip, fly into that kitchen of yours and whip up these incredibly easy burgers and enjoy the leftovers all week long for a protein-packed pick-me-up. They would go lovely with breakfast, a snack, or lunch on the fly. If you make 12 large patties, each burger has about 9-10 grams of protein (rough calculation only). And because I can never let any recipe be, I played around with the recipe and prayed for a successful outcome. The result was a delicious falafel patty with a seedy crunch and crispy exterior. At the end of it all, I had just one processor bowl to clean up. And by clean up, I mean that I blasted a second of water on it and tossed it into the dishwasher. I almost shed tears of joy, my friends, tears of joy. 1. Preheat oven to 375F and line a baking sheet with parchment or a non-stick mat. 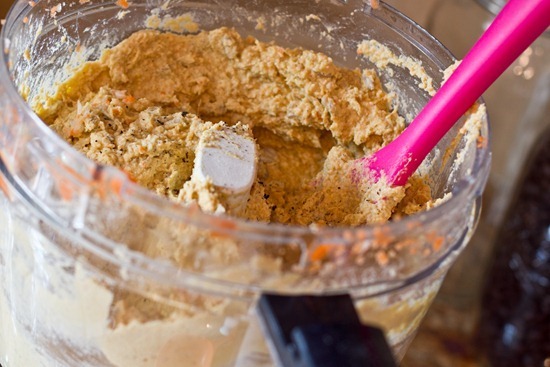 In a food processor, process the garlic, carrot, and onion. 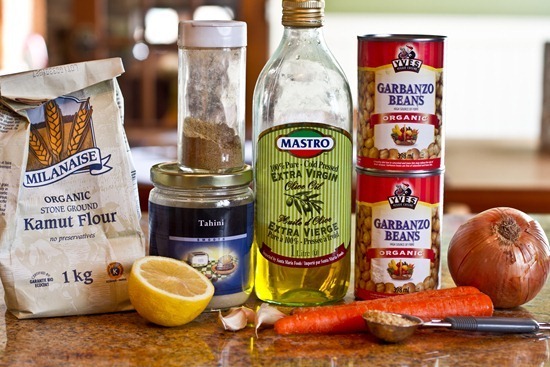 Now add in the drained chickpeas, lemon juice, olive oil, tahini, cumin, and salt. Process until fully combined. 2. Add in the 1 cup of flour and process again. You may have to stop the processor and use a big spoon to stir. Finally, stir in the sunflower seeds. Season to taste with pepper and paprika. 3. Spoon about 1/4-1/3 cup of batter into baking sheet, leaving about 3-4 inches between each scoop. Wet hands and flatten until patty is about 1/4 inch thick. Repeat for all patties. Sprinkle with Paprika. 4. Bake at 375F for 20 minutes. Now, very gently flip the burgers and bake for another 5-10 minutes. If you do not use a baking mat like I do, your burgers will likely cook a few minutes faster so watch carefully. Burgers will be golden brown when ready and slightly firm. Allow to cool for at least 15 minutes so they can firm up and cool completely before storing. My burgers got soft after placing them in Tupperware. I’m not sure if this is because they were not cooled properly or not. Absent from the photoshoot: raw sunflower seeds, which were an after thought. :) I also did not use the ground flax like I thought I would. The ‘batter’ is like a jacked up tahini-rich hummus…with a crunch. Scoop about 1/4-1/3 cup of batter onto baking sheet and flatten with wet hands. You want the burgers to be quite thin so they will cook throughout. More surface area = quicker cooking time. Bake for 20 minutes and gently flip over and bake for another 5-10 minutes, watching carefully. 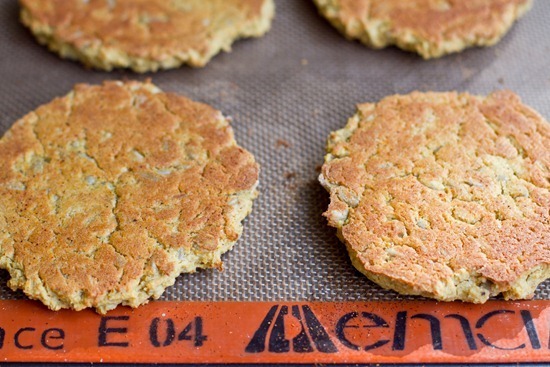 If you do not use a baking mat like I do, your burgers will likely cook a few minutes faster. The burgers will be golden brown on one side, but not to worry. This gives them that crispy exterior! Serve them on a burger patty, in a sandwich, crumbled on a salad, or with a warm pita with your favourite toppings and sauce. I turned into a Falafel Burger Pac Woman after I tried one. .. 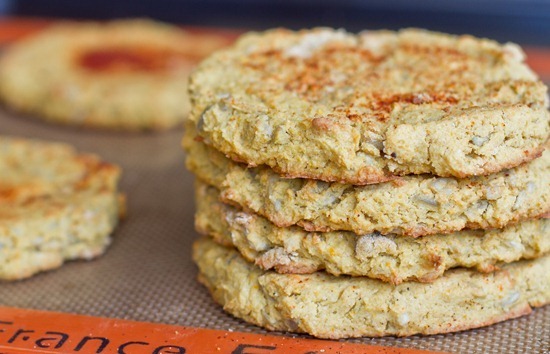 If you are feeling crazy you could always do the Falafel Double Down Version too…by smothering a couple spoonfuls of hummus in between two patties. 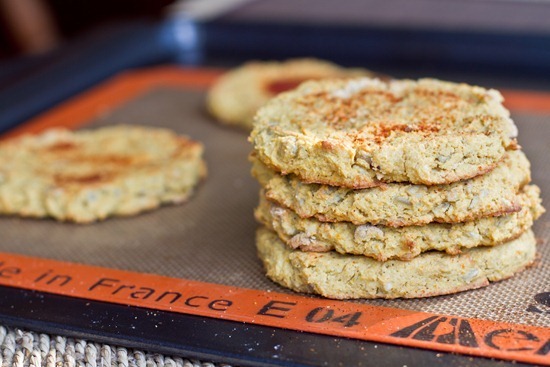 That is always a favourite of mine with chickpea burgers. And I think I just heard a bird chirp. March, you are off to a good start! Haha, I agree– I love the summer months the most, but when February is over, it just feels like we’ve turned a CORNER!! Love it! These. look. awesome. If only I had a food processor and a baking sheet at rez! may i ask, what is the advantage of the baking sheet? thanks! the Silpat is awesome, I cant say enough good things about it. It prevents sticking and eliminates the need for parchment paper and secondly it results in more even baking. I have noticed a difference, especially with cookies. Hahahaha love the Pac Woman! Yum, those look great! The crunch is key for me. Nothing like a mushy veggie burger, lol! Yum these burgers look delish, I agree with your idea of slathering hummus between two and eating it that way! Do you eat Sabra Hummus?…I think they put crack in it…. Om nom nom nom. Those look delicious. I LOVE falafel. Or well, anything chickpea really. I’ll have to try these out sometime soon. -9c? 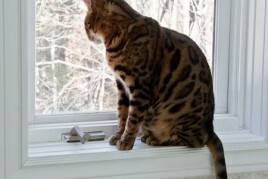 can i has.. it is like almost -40c here right now, i woke up to -45c and my car didnt start :( i should live with you! Mmm…I’m loving your idea for the falafel double down burger. That sounds positively scrumptious! Oh I love falafel, but I never thought of turning them into burgers. Will make those burgers for me and my boyfriend soon! I had something else planned for dinner, but just realized I have all these ingredients on hand! Time for a change of dinner plans! Yum. Reporting back post-dinner! These were SO delicious!! I left out the tahini because my husband and I don’t care for the taste, and I left out the sunflower seeds because I didn’t have any on hand. We just ate them with a fork on a plate (didn’t have any pita) with a little ketchup (because ketchup is good on just about anything). Some steamed broccoli, rice, and a salad rounded out the meal nicely! My husband and I are already looking forward to taking leftovers in our lunch tomorrow. :-) Thanks for the great recipe, Angela and Julie! Holy yum…I adore falafel. And burger form? Sign me up! Thanks Julie and Angela! I LOVE the look of those burgers! 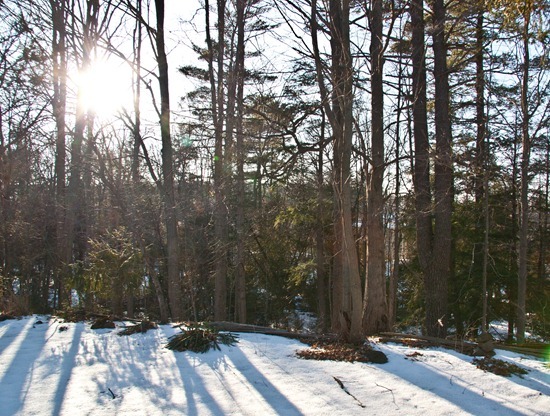 And I agree — it might not be warmer, but it’s LIGHTER outside… for longer. This makes me very happy, and is a sign of spring!! Thanks Julie and Angela for the latest recipe off my printer. Can’t wait to try. It’s like a hummus burger! Ohhhh those look great! I think I might give them a try! And I am so glad to be done with February! You never fail to impress me with your chickpea transforming skills. I’ve yet to try falafel due to them usually being fried..but these definitely look like something worth trying. I bet they’re amazing! I also have been dying to make julies and these look so amazing as well. I wish I had my old food processor! Mrs. Pac Man! Now I have the urge to find an app for that… LOL! Great idea reducing the oil. I bet these would be great crumbled in a pita with arugula, tomato, and tzatziki sauce. These look great, especially being so simple. Love the idea of the added sunflower seeds for crunch :) I’ve just finished my stock of dried chickpeas though, maybe I’ll grab a can just to whip these up fast! These look great! I’m OBSESSED with chickpeas at the moment so will definitely be giving them a try! love the vegan double down. best thing I’ve seen all day! These look amazing! Do you think I could use chickpea flour? Dang, those look AWESOME! I will definitely be trying these very soon. Add some hot sauce to those babies! Oh yum. I love falafel, a whole burgerful of it sounds awesome! These look FABULOUS! I bet they’d be wonderful with homemade tzatziki. Awesome. 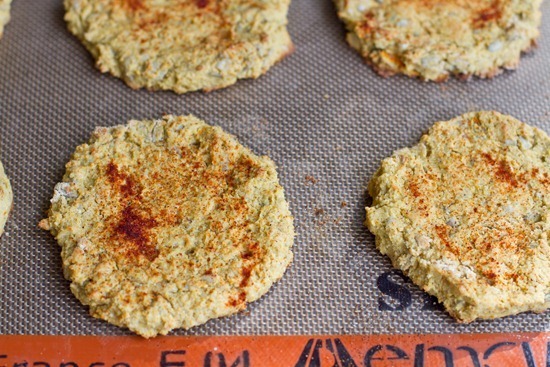 A felafel burger recipe that doesn’t crumble to pieces. I can’t wait to try this. -9C? that is nothing! This morning was -43 with the windchill is Saskatoon, SK. This looks wonderful, might stay inside tomorrow and make some! 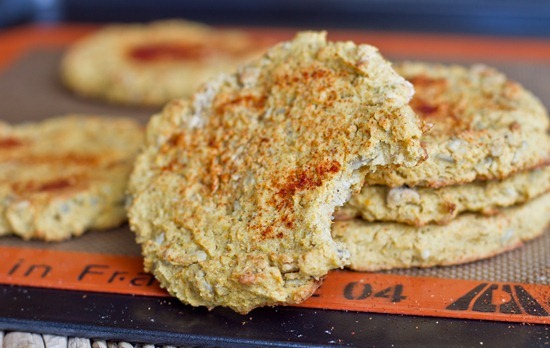 I adore falafel/chickpea burgers to bits! These are a wonderfully simple version! YUM – thanks for sharing the greatttt recipe! They look delicious! LOL, love the Pac burger! This reminds me I have Sunshine falafel burgers in the freezer. Yours look yummy! I have never thought of making burgers that way… they look great! Definitely going to try them very soon! haha i love the falafel double down idea!! it’s only about a million times healthier than the real double down lol. these look awesome Ange! i had my first falafels last week (http://wp.me/pSUCS-1H8) and they were delicious! i like them pretty spicy, and the ones i made certainly did not disappoint. i love your addition of sunflower seeds – great idea! I put the leftovers in a tupperware container in the fridge and they got soft…did that happen to you? maybe i didnt cool them long enough! I think when i reheat them I will throw them into a skillet and try to crisp them up again. What an interesting recipe. Looks tasty! Wahoo for March … love March and not just because it’s my bday month :) Loving the longer days too. 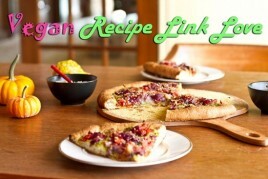 Can’t wait to try this recipe – yumm! 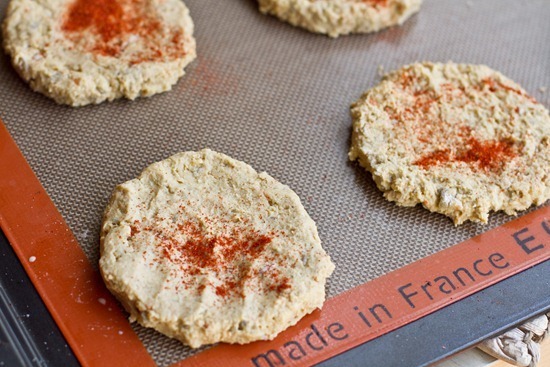 tahini+chickpeas+paprika= a match made in heaven! 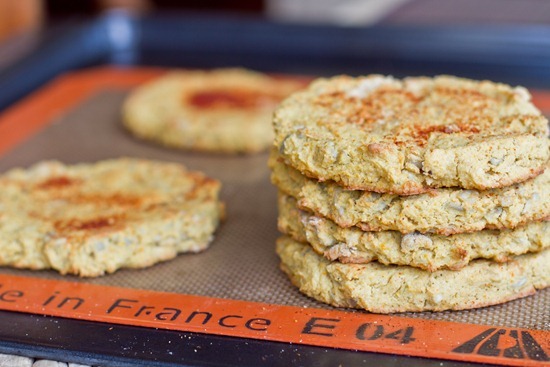 can’t wait to make these…..falafel is amazing on its own, but in burger form…watch out! Gotta try these! Falafel is one my favorite foods. I always look forward to falafel wraps every Thursday at my school. I need to try different types of burgers. These look like another great recipe for my food processor! Those look delicious. I am also SO ready for the spring months. Warmer weather can’t come soon enough! 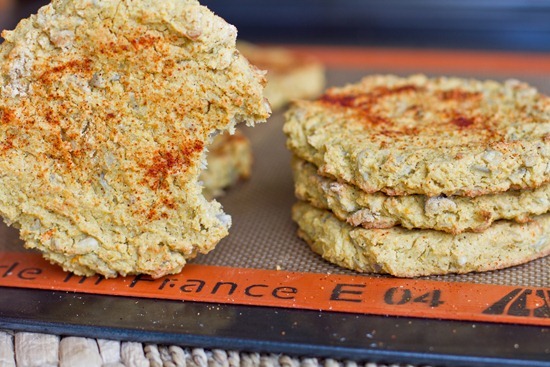 The one time I tried to make falafel from a box, I accidentally flattened them into burger patties, and have to say they were pretty good…imagine how amazing they could be if they were intended to be made that way! What brand is your food processor? Have you had any problems with it? I cannot believe I have gone this long without one! have a 12 cup Kitchenaid and it works decent…although I am often frustrated with how much I have to stop the machine and scrape down the sides of the bowl. Wow, these sound delicious *and* easy. That’s my kind of meal! I am actually pre-drafting a post about things I usually buy at the store vs make at home, and although i make most everything from scratch, I admit to still buying pre-made veggie/bean/seed burgers. I need to get over that, huh. And try a falafel burger! I’m excited for march too! Bring on the sunshine! I had my first falafel at Christmastime – I had no idea what I was missing!!! These burgers look so good – I can’t wait to try them. I just made these and you are right. Totally awesome!!! I halved the recipe and got 8 burgers. I am going to freeze some unless I eat them before they can get in the freezer! Great recipe from Julie!!! I hate february! Looks like winter is never going to end. March is the beginning of warmer spring weather :). I agree, February is my least favorite month and I am so happy that it is March!! Those DO look amazing! I love falafel anything! I can’t wait for warmer weather – March is such a tease! OMG those look amazing! And how’s this for perfect timing… I just bought a huge bag of chickpeas and accidentally made way too many.. I have a major thing for falafel–these sound stellar. PS: I made your avocado-tahini dressing and chickpea salad last week. Loved it!! YUM! Falafel is so good! These burgers look amazing. Now i’m thinking of all the toppings I could put on those! I am definitely trying these within the next few weeks…A lot of your recipes find their way onto my blog Angela! It’s pretty much a GUARANTEE that I can leave your blog with a few recipe inspirations. As always, thank you! 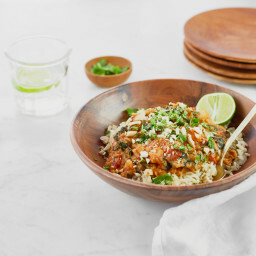 One-bowl dishes are the most amazing thing in the world. Ever. Thank you! Looks really good! But between the tahini, oil, and sunflower seeds, there is a lot of fat in this recipe, correct? How would you suggest decreasing the amount of fat? You say falafel burgers. I say falafel cookies. My chickpea/falafel addiction is consuming me. These look amazing! There is nothing better then a recipe I already have all the ingredients for! I have a falafel recipe I use all the time and they are great BUT I look forward to making these. Not only do they look and sound amazing but I like the idea of sun flower seeds! The pac woman image made me chuckle. Ahaha, I laughed when I read ‘on March 1 there is hope’. I’ve been saying this to people all week, but for completely opposite reasons: We’ve just had the equal hottest summer on record in Western Australia and it’s forecast to remain in the high 30’s (C) until next weekend. But because it’s now Autumn, as far as I’m concerned, the end is in sight! I think I am going to have to make these TODAY! Thanks Angela & Savvy Eats! I die. Falafel is basically my favorite thing in the world. Can you say in my belly, asap?! Oh, those look really good! I made a recipe that was sort of similar to this one and my husband and I ate them for three weeks straight! I bet we’d like this one, too. Yum, these burgers looks delicious!! Although I am not a vegetarian or vegan, I do not eat regular burgers (probably haven’t had one in nearly 15 years! ), so I am always looking for a great veggie burger recipe. This one sounds perfect! The “Falafel Double Down” is a hilarious idea. These look delicious! Just wanted to say that I’ve voted every single day for you in the “Best of Health Blog Awards”. Good luck! I will have to try those… SOON! You should really move further south, it was nearly 75 here in Texas. It’s been t-shirt weather for a while now… Then again, I hate the snow so I’m probably biased. I am sooo over winter and would love just love for the snow to be gone aswell. I think we may be not that far from one another. It’s always just a tease though… one last snow story always seems to appear out of nowhere!! Yuummm, I love anything that can easily be transformed into burger form. 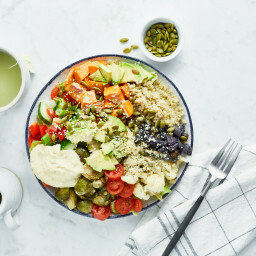 Give me a spoonful of tabouleh, and I’ll be set! i hear you on february blahness. march is finally here! northern winters drag on forever. now we just need somemore sunlight. 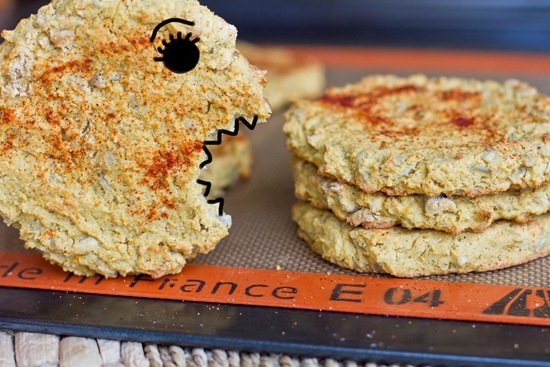 & i also need to eat these falafel burgers! do you grow any of your own veggies? Those look downright sensational–and easy! Gotta love that they’re all natural and packed with protein. Thanks! Eventhough spring is near i’m still waiting for some snow! These protein packed pattys sound amazing and look like a great snack too! These look so delicious, I bet freezing them and grilling them in the summer would be a great option! Those look delicious! I can’t wait to try the recipe. Just curious why you close comments on prior recipes/blogs? If I have a question about an old recipe should I post it on your most recent blog? I’ve been trying out a lot of your recipes and find myself wanting to comment on how awesome they are but can’t. I close the comments after 30 days because it is otherwise difficult for myself to keep up with comments on older posts. How many burgers does this approx make? Oh sorry, I must have missed it. Thanks!! I am making these tonight, they look delish!! These look delicious. I am crazy about falafel, I would love these. LOVE the last pic!! Cracks me up! I think I might halve the recipe and give it a try! Would these work without the tahini? I am out. :( Do you taste it a lot? These were delicious!! I used kidney beans instead of chickpeas (like Caitlyn at HTP did), because I am out of chickpeas. :) I ate them with plain yogurt and kale chips. Yummy! These are so yummy! I was out of sunflower seeds but I sprinkled sesame seeds on the top with the paprika. Love it! Then I took the leftovers the other night and topped them with a whole roasted green chili, black olives and some pico de gallo-stuck under the broiler to heat up. Served with salad and spanish rice. It was to die for. The last one was a snack with some plain old salsa on top. I will be making these again for certain! LOVE falafels!! They make me bloated but I never learn!! This looks yummy and I want to make it! Could you tell me how many patties per serving?